Unique southern facing soundfront property now available in Wrightsville Beach, NC in the premiere primary residence community of South Harbor Island. Listing by Hardee Hunt and Williams real estate company, MLS# 477077. Wrightsville Beach, N.C., May 2012 -- The opportunity to purchase a unique southern facing Wrightsville Beach property has now been made available through a listing by Hardee Hunt and Williams real estate company. The soundfront home at 205 S. Channel Drive on South Harbor Island in Wrightsville Beach, N.C. is listed for sale with MLS# 477077. The waterfront location within the premier residential community of South Harbor Island helps to make 205 S. Channel Drive a desirable property. South Harbor Island is a secluded community of high end primary residences conveniently located to Wrightsville Beach shopping, dining, and recreation, while out of sight and off the beaten path for summer visitors. The area is thoughtfully laid out with ample green space providing residents with parks, boulevards, sidewalks, and well-established old growth coastal trees. Property highlights and features at 205 S. Channel Drive include a private pier and boat lift, a multi-vessel dock, 87' of water frontage, impressive waterfront exposure, a .24 acre lot, and long range, unobstructed water views. The southern exposure of this home overlooks Motts & Banks Channel. There are dual waterfront covered decks providing soundfront and amazing sunset views overlooking the water from two lower guest suites, as well as incredible views from the upper level living room, kitchen, and dining areas. The property is surrounded by well established old growth coastal landscaping including cedars, myrtles, and fruit bearing fig trees. The location provides convenient access to North Carolina's most well maintained and navigable inlet at Masonboro for small and large vessels. Hardee Hunt and Williams is dedicated to Wrightsville Beach real estate with a focus on waterfront homes, condos, primary residences, and investment properties. They have extensive experience with Wrightsville Beach real estate and are knowledgeable about the island, it's properties, history, and real estate opportunities. 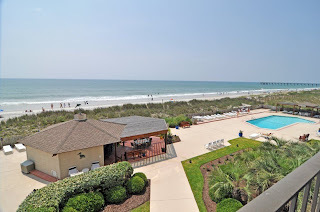 They are adept at serving the needs of both buyers and sellers and offer the local connections and relationships that can help discover or effectively market Wrightsville Beach properties. 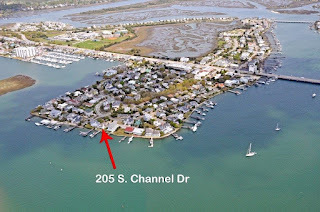 To learn more about the waterfront property at 205 S. Channel Drive, please visit http://www.205SChannelDrive.com. To learn more about Hardee Hunt and Williams, please visit http://www.HardeeHuntandWilliams.com. Have you been following the Fire on the Dock local chef's competition here in Wrightsville Beach? Shell Island Resort is host to this Wilmington North Carolina area cooking competition featuring our favorite local chefs and mystery ingredients local to NC. The secret ingredients so far have included flounder, Cheerwine (! ), bison, curry, strawberries and asparagus, pork, milk and chocolate, eggs, bacon and ham, and poulet rouge and perfect puree. This 8 week event has featured 2 battles per week and we're down to the semi-final battle this week. Andy Hooper and his team from Chefs 105 in Morehead City will battle the winner from Marc's on Market and Coral Bay Club. Gerry Fong and his team from Persimmons in New Bern will battle the winner from Swim with the Fish and Cameo 1900. This is an amazing opportunity for local chefs and restaurants to showcase their talents and for area foodies to experience Iron Chef style dishes. Reserve your tickets now to experience the fun and excitement of the Fire on the Dock event and maybe even get inspiration for your own kitchen. Get complete details including chef bios and results from previous battles at Fire on the Dock Competition Dining. The oceanfront condo unit at 1704 North Lumina Ave, Unit 7-D at The Islander Condominium highrise is for sale by Hardee Hunt and Williams. The asking price for the 2 bedroom, 2 bath condo is $519,900. Wrightsville Beach, N.C., May 2012 -- The Islander oceanfront condominium community is a long established and well managed Wrightsville Beach property. The agents with Hardee Hunt and Williams real estate company recently listed a two bedroom, two bath unit at The Islander for sale. Tucked into a quaint section of Wrightsville Beach, North Carolina, The Islander community features and benefits include secure entry, ample parking, a private oceanfront pool with native landscaping, outdoor grills and a tiki bar, private tennis, an elevator, exclusive beach access, and on-site management. The well managed HOA provides an all inclusive, low maintenance lifestyle. The condo unit for sale at 1704 North Lumina Avenue, Unit 7-D is a penthouse suite which includes a private rooftop deck with 360 degree views. The Islander is ideal for full time residence, a second home, or as a vacation rental investment opportunity. Hardee Hunt and Williams is a specialized firm dedicated to Wrightsville Beach real estate, representing both sellers and buyers in this southeastern North Carolina beach community as well as at nearby Landfall and Figure Eight Island. With extensive experience in real estate in this area as well as a long history of living and doing business here, the agents at Hardee Hunt and Williams have the knowledge, experience, and connections it takes to find the ideal buyer and seller match for Wrightsville Beach homes and condos. For more information about 1704 North Lumina Avenue at The Islander on Wrightsville Beach, visit http://www.theislandercondos.com. To learn more about Hardee Hunt and Williams, visit http://www.HardeeHuntandWilliams.com. The Wrightsville Beach Farmer's Market kicked off yesterday, May 7, 2012 and will be held on Mondays through September 3rd on Old Causeway Drive across from the Post Office from 8:00 a.m. to 1:00 p.m. This year marks the 4th season the Farmer's Market has been in Wrightsville Beach. 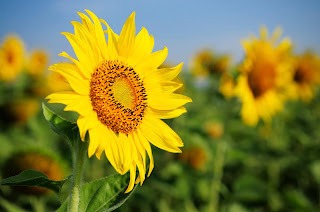 It provides local residents and visitors a chance to connect with area farmers, growers, and vendors and purchase fresh, locally grown produce and more. We are so excited to have the Farmer's Market back. It's a great way to connect with our neighbors and the Wrightsville Beach community while supporting great local businesses and healthy eating. Mark your calendars so you'll remember to visit the Farmer's Market on Mondays. It goes until 1:00 so you can even stop by on your lunch break! For more information, including vendor applications, visit Town of Wrightsville Beach - Farmer's Market.